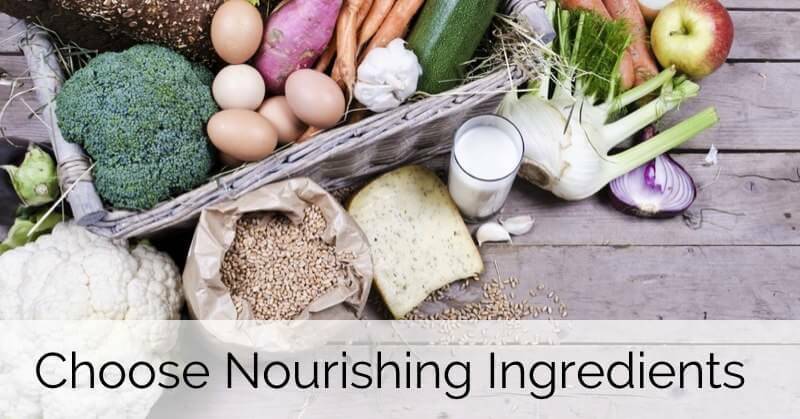 Do you need help choosing better ingredients for your recipes? Here you will find a guideline that Oh Lardy uses when we are trying to choose more nourishing ingredients. We base our choices on Weston A. Price’s teachings, as well as information from Real Food advocates such as Michael Pollan and Joel Salatin. Best: organic dried beans, soaked to minimize enzyme inhibitors and phytic acid. Avoid/limit: low fat cheese, processed cheese, cheese slices, fake cheese spreads and cheese like substances. Avoid/limit: fake eggs, egg beaters, cholesterol free eggs, etc. Best: (organic) cold pressed Coconut oil, organic, pastured raw butter, ghee, and cold pressed extra virgin olive oil. Lard, tallow, and bacon fat should come from pastured animals only. Good: occasional use: cold pressed (organic, if possible) sunflower oil, cp avocado oil, cp macadamia nut oil, cp walnut oil, cold pressed sesame oil. These are all really good oils for occasional use. Good: Conventional (Dirty Dozen) wash well. Frozen conventional. Avoid/limit: canned fruits/vegetables. If you must, look for organic and non-bpa cans. Also try to avoid papaya as almost all are GMO. Better: Full fat, pasteurized milk, organic from grass fed animals, preferably not homogenized. Good: Any nut and seed, they are good for us! Try to find from pastured animals, Organic if possible. No hormones or antibiotics. They should be Nitrate/Nitrite free (this is controversial, though, as these meats are usually cured with celery salt which naturally contains nitrates). Read ingredient labels! Do you know what the ingredients are? Can you pronounce them? Would your great grandmother consider this food? Best: Celtic Salt, himalayan salt, good sea salt. Avoid: processed, refined salt, iodized salt, kosher salt. Remember to limit all of these. No matter how much nutrition a sweetener has, it is still A SUGAR!! Use sparingly!